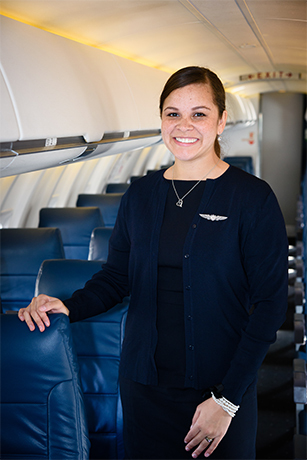 Air Wisconsin’s flight attendants are key players in our United Express flying operation. As dedicated professionals, their priority is the well-being of passengers, ensuring that each travel experience is safe, comfortable and secure. Additionally, our flight attendants pride themselves on offering top-notch customer service, providing a positive inflight environment. As the sole flight attendant on each aircraft, you are the face of Air Wisconsin! A personal greeting and smile, a kind, courteous and respectful attitude, and a warm and genuine, “Welcome aboard!” are the hallmarks of our cabin crews. Our inflight service includes a variety of complimentary soft drinks and juices, as well as a selection of beverages and snacks that are available for purchase. The dynamic nature of the airline industry offers an exciting future. Let Air Wisconsin take you to places you’ve never been! Successful candidates may be required to relocate. Crew bases for new hires are not guaranteed. Able to stand, stoop, bend, squat, twist, turn and be able to push, pull and lift up to 45 lbs.